From the last few weeks, I noticed that Google has started displaying Wikipedia business links right beside the main site result in the SERP. Have a look at the below screenshot for the query "free games". 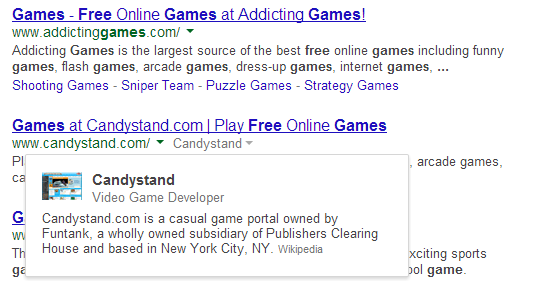 This screenshot displays the Wikipedia snippet for candystand.com. We can click on the Wiki link to visit the Wikipedia for candystand. Why A Sudden Display of Wikipedia Links? Wikipedia recently discovered that traffic to their site has dropped because Google had started displaying information from the Wikipedia pages in the Knowledge Graph. When users were able to get the information in the Google SERP itself, they didn't felt the need to visit Wikipedia. This caused a sudden loss of traffic for Wikipedia even though the information was provided by Wikipedia and not Google. Some of the media houses also covered this story and highlighted it by saying that "Google eats up Wikipedia traffic". Now, Google has come up with some sort of relief by displaying Wikipedia links right beside the main business website links. This will surely pass on traffic to Wikipedia. Is it Related to Ranking? Certainly, internet marketers might feel that Google displaying Wikipedia links means business whose Wiki links are getting displayed in SERP are trusted more by Google and hence can easily get ranked in Google. But, the truth is there is no correlation between Wikipedia pages and rankings. The Google algorithm does not specifically takes into account Wikipedia links while analysing the relevancy of the sites. However, domain authority and overall trust are still factors for high rankings. Hence, indirectly it will surely provide the benefit as people trust businesses who have a corresponding Wiki page. Plagiarism - What to Do if Your Content Gets Plagiarized? How to Write a Reconsideration Request? How to Tag a Site in Google Webmasters?